Along with Woods' Buddha pattern, this is one of Frederick Rhead's earliest tableware designs for Woods, dating to around 1914. 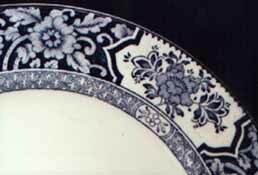 Khotan and Buddha share very similar stylised floral borders, a variation of which occurs in Woods' Ming tableware (right), marketed from 1915 via Woolworths. 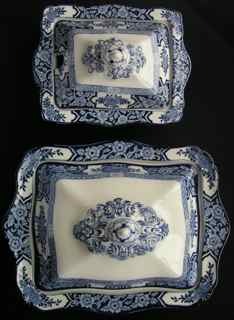 The distinctive shape of the Khotan and Buddha tureens (left) and meat plates is found also in Rhead's Orient pattern (centre right). 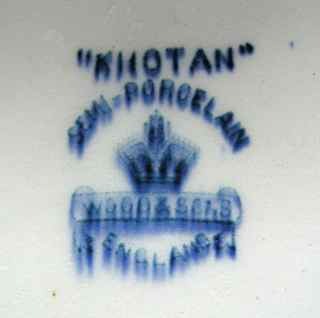 Lacking its own distinctive backstamp motif, Khotan items usually bear Woods' ROYAL SEMI PORCELAIN mark. 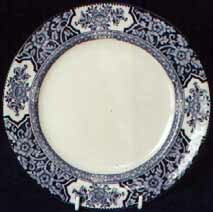 Plates generally have white centres, but one occasionally comes across dessert plates with an oriental landscape scene in the centre (see photo below), reminiscent of Rhead's Kang-Hi pattern. It is not known if this scene occurs on any other items in the range. 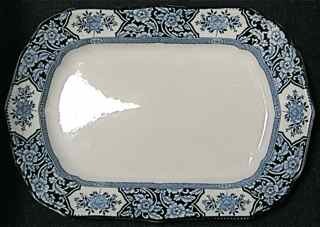 Although not marked KHOTAN, the plate has a similar WOOD & SONS SEMI-PORCELAIN mark. 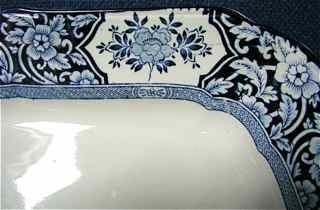 The sauce tureen is shown right next to the vegetable tureen for comparison.